...right on the other side of Finals (dun dun dunnnnnn). And because I know you're stressing (because it is literally the most stressful part of the semester), I'm compiling some of my favorite study tips into this one post! 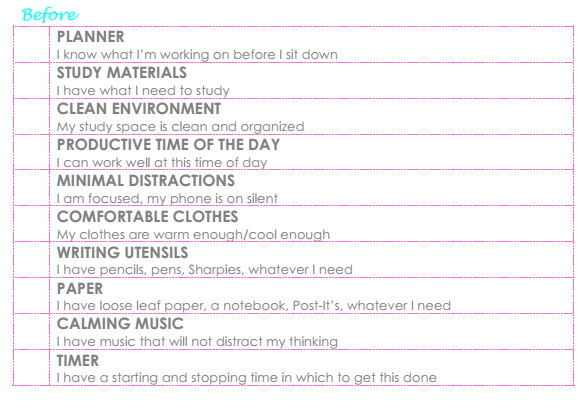 (complete with a free little checklist to hang up in your study space to remind you)! READY?! Planner: SO IMPORTANT! Have a plan before you sit down to study! Otherwise, you'll just spend a bunch of time trying to figure out what you already have done, what you need to do, and where you need to start! Keeping a planner that is up -to-date cuts down on prep time and boosts actual study time! Study Materials: Where are your notes? Your textbook? Did you leave something in your car? Do you need to print some PowerPoints from your class website? GATHER everything BEFORE you sit down to study! Nothing is more frustrating than being ready to work and then realizing you don't have everything you need to be able to work! Clean Environment: Sometimes, if I'm having a hard time focusing, I look at my environment. Do I have papers scattered all over the place? Are there random things that are out of place that are subconsciously distracting me? Take a minute to organize things and get your study environment as clean and organized as possible! Productive Time of the Day: What time of day do you work best? Research shows that 9am-12pm is typically the best time for completing cognitive tasks (which is why most businesses and schools are open during this time), but YOU know YOU better than anyone. Are all of your roommates out between 1 and 2 every day? Then maybe that's your most optimal time! Minimal Distractions: You love Instagram. I love Instagram. We all love Insta. And Twitter. And Pinterest. But they are a constantly alluring distraction from the task at hand (studying, duh). And guess what? That just makes you want to check your phone even more. Resist the urge! In fact, eliminate it altogether by putting your phone on silent and sticking it in a drawer or in a different room. And no, sending Snapchats of yourself pretending to be asleep (or crying) while surrounded by your notes does not count as studying! Sorry. Comfortable Clothes: If there were ever a perfect time for Victoria's Secret's entire PINK collection existing, it's Finals week! This is literally (and by literally, I mean figuratively... obviously) your free pass to live in yoga pants and over-sized t-shirts for the next two weeks! TAKE ADVANTAGE! Writing Utensils: This is so beyond obvious that I feel silly even mentioning it. BUT really think about what kind of writing utensils you need for studying! Highlighters for highlighting in your text book? Pencils for doing math? Colored pens for editing your paper? Put some thought into what would benefit you the most for studying each subject! Calming Music: A long time ago, we used to have to buy those relaxing CD's from Target (you know, the one's where you could select a preview to every single one first?). But these days, we are super blessed with things like iHeart Radio, iTunes Radio, and Pandora. Go to "Add New Station" and then select "Browse Genre Stations"... there are countless choices! 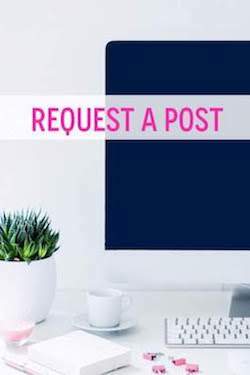 And if you need some choices, check out this post! Timer: I work faster with a time-limit! And I'm guessing you do, too. This really, REALLY helps to cut down on distractions because you know that, if you only have an hour, you better not waste any of that time by Facebook stalking. There will be plenty of time for that when the timer goes off. Start: If you're a new reader to this blog, you should watch the video in this post. It's less than 5 minutes and the information is INVALUABLE for productivity! One of the most important things that I learned from it is to JUST START! Once you've started a project, your brain gets this nagging feeling to go back and finish it! And if you're having a hard time starting, maybe check out this post to find out why! Focus: I've said it before and I'll say it again: One thing at a time. One day at a time. This is the motto that my super laid-back (no really, like Matthew McConaughey level of laid backness) husband tells me to repeat when I'm feeling overwhelmed. Some other of his favorites: do less and just get it done. Track Your Progress: WRITE DOWN WHAT YOU DO! This allows you to (1) be proud of yourself and (2) keep up with where you need to begin next time! Relax: Last spring, I posted a video from Dr. Marty Lobdell on studying. One of the first things he says is to work for less than one hour! In fact, most of our attention spans run out around 30 minutes. So even though pulling an "all nighter" may feel productive, it's actually having the opposite effect! Your mind (and your body) need sleep, too! Study in smaller, super-intense bursts of time instead! Update To-Do List: If you want, you can print out the free printable progress tracker in this post to keep you up-to-date with your progress on different assignments. OR, you can just use a regular old piece of paper to keep up with how far along you made it during your "bursts" of study time. When it's time for you to stop working because your timer went off (or because you came a little too close to throwing your laptop across the room), write down the very next 3 things that you need to do for this project! This will allow you to get straight back to work as productively as possible the next time you work on this project! Clear Computer Desktop to Neutral: Clear to Neutral is a beautiful concept. You can read all about it here, but the basic idea is this... Leave everything exactly the way you want to find it next time! Instead of leaving 14 windows open on your computer when you go do sleep, name every file! Close every browser window! And straighten up all those loose documents into neat and organized files. You can leave your most frequently used documents and folders on your desktop but that's all! Clear Actual Desktop to Neutral: So, no one looks at a super messy desk and says "ooh, I could get so much work done there!". They just don't. Keep your environment organized. Put papers away... even if it's just into a drawer for now. Your study space should be a place where you actually enjoy being! Reward: Um, hello? You just checked a few things off of your to-do list? GOOD JOB! It doesn't have to be perfect. You don't have to get it all done right now. There will always be more to do (believe me, always). Every time you work on schoolwork, you're more prepared than you were before. So, celebrate that! Give yourself permission to mentally check out while mindlessly scrolling through Tumblr. or watching a silly YouTube video or having cookies or champagne (or all of the above). Here is a printable version of the checklist (if it works)! How are you preparing for finals? Are you feeling overwhelmed or do you feel like you've got it together? Can you think of anything to add to this checklist? If so, add it below!